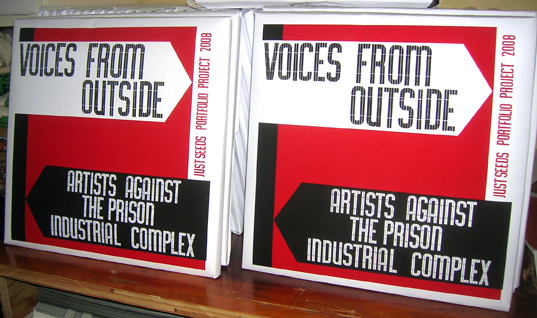 Wisconsin Books to Prisoners was the recipient of a powerful set of posters created by 20 printmakers from the JUSTSEEDS Visual Resistance art collective. These posters were created in anticipation of the 10th anniversary of Critical Resistance, a prison abolitionist movement, and call attention to the human rights catastrophe in U.S. jails and prisons, and the use of policing, prisons and punishment as a “solution” to social, political and economic problems. The posters and artwork by prisoners will be displayed at a gallery in Madison at the end of January 2009. Art that addresses the condition of prisons and the daily drudgery and cruelties of prison life would be particularly appreciated. Please do not send anything that you want returned or is not copyright free. Also, please let us know how you wish to be (or not be) identified. Submission are welcome throughout the years to come, but for this show the due date is: January 1st, 2009. Many thanks in advance to those who make contributions to this event.